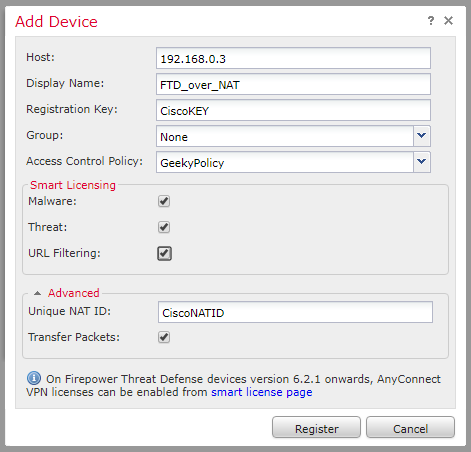 Home Blog IP Networks Enterprise Networks Dealing with Cisco Firepower Management Center (FMC) and Firepower sensor communication. Registration process. This post should help you to understand the Firepower sensor registration in FMC process and uncover the communication specifics between firepower components. I will also give you some additional hints what to check to verify the registration. In order to make troubleshooting easier there will be dedicated troubleshooting post later on. To follow the registration process I will capture the traffic between these two devices. HS_PACKET_BUFFER_SIZE is set to 4. FMC sends Reset TCP flags, on every SYN attempt of the FTD. Enter the sensor details and click on register. Be careful with the Registration key. It should be the same on the both devices. Figure 2. Filling the sensor details. On the backplane I will sniff the connection again. This time I will capture the traffic on a pcap file and I will follow the communication on Wireshark. We see that the FMC initializes the communication to the sensor. Packet #3 SYN to 8305 originating from the FMC. 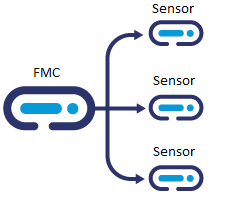 Now you can see your sensor added to the FMC. 3. When and how to use DONTRESOLVE option? The FMC sends request which is NATed by an edge device (static NAT is required). 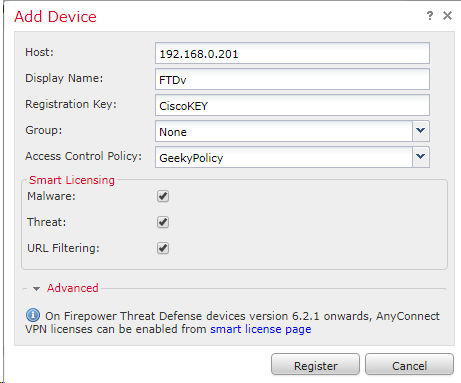 The FTD receives the SYN but does not compare the IP with its configuration manager, but it compares the NAT ID. If the NAT ID is the same, then FTD accepts the request. Then show managers – shows UUID instead of IP address. If there is not a Static NAT record on the device in between, it is normal to see the following message. You must also define a ACL to permit the traffic. Figure 6 – Error saying “Could not establish a connection with the sensor“. In my lab, I will use ASAv to translate FTD management IP. On screenshot of the FTD console we can see that 192.168.0.200 initialized the connection to 1.1.1.11 on port 8305. Now there are no Reset TCP flags and the registration is done. 4. How to check if FMC management port 8305 is open? If you see no output, it means the FMC does not communicate with sensors and it is not even attempting to communicate. 5. How to delete a sensor? It is highly recommended to delete a sensor from the FMC if you want to reimage it and add it again to the FMC. 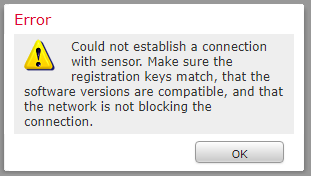 If you miss to delete the sensor you may hit problems while adding it again. It is important to know that the policy will be working even if the sensor is being deleted from the FMC. It handles the same access control policy until another FMC is registered and pushes its own policies. Also important to know is that newly added sensor to the new FMC will fetch the policies from it. See Figure 2. You will see that you choose the ACP during the registration process. Consult your system admin for details. In the next post I will provide some hints for the FMC and Firepower sensors troubleshooting to achieve right communication. Marvelous Article. Keep up the good work.